Each property we care for has a captivating history that provides us with direct links to our past. To varying extents they have all experienced ‘change’ in the past, be that changing hands between feuding families, being brought into ruin by a passing army or disappearing for millennia under a changing landscape. Their stories don’t stop there however. Our properties now face a common challenge going into the future, in the form of our changing climate. 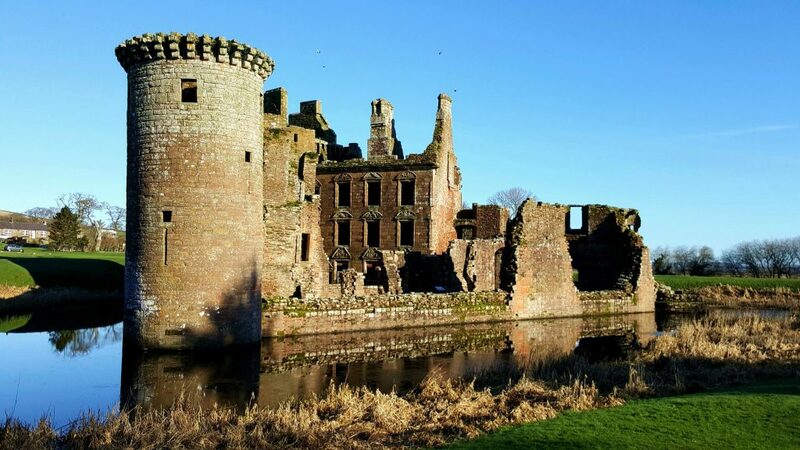 With a diverse range of sites, constructed from different materials and in different styles, as well as being located in varying settings, the challenge to protect and preserve only gets trickier. Taking the important first steps to protecting our heritage against climate change starts with looking at what the risk is now. A thorough understanding of the threats as they are now lays the foundations for any future work. And that is exactly what we are in the process of doing. Changing climate patterns have a wide range of implications for our properties. There are changes that will affect the fabric of our buildings and sites specifically, then there are those that will affect the landscape and grounds around them. Its worth noting that we are already observing many of these changes. Climate change is more than a future risk, it is already happening. Looking at the impacts on the built fabric of our properties is a well-established area of research. It is generally agreed that changes like increased rainfall will have a detrimental impact by enhancing rates of decay in stone. This is something that is being continually investigated, but is only one example in a list of many probable outcomes of climate change. But what about hazards like flooding, coastal erosion and landslides? Where (and how) they are currently happening is intrinsically linked to the climate, so it is essential we understand what the risk to our sites might be. With that in mind, we are in the process of conducting a Climate Change Risk Assessment of our own estate. 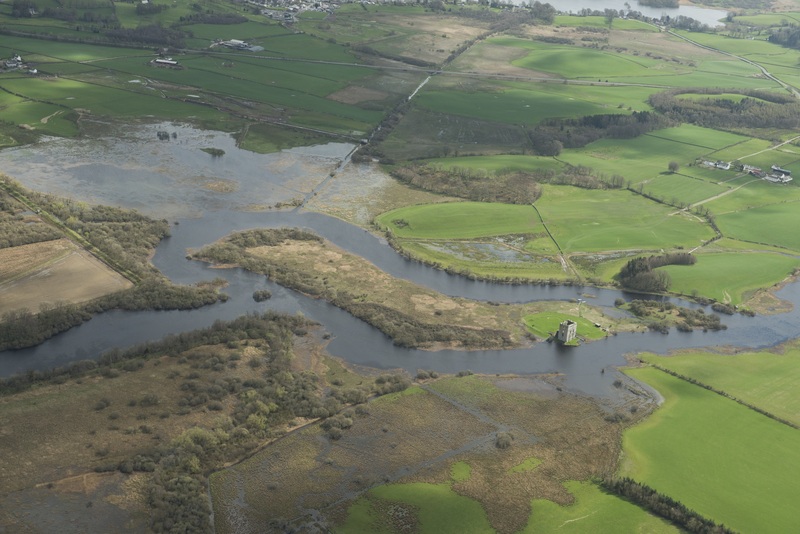 Flooding in 2014 of the River Dee surrounding Threave Castle (centre right) (© Crown Copyright – Historic Environment Scotland). 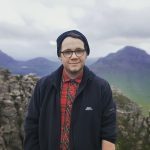 To do this we have teamed up with the British Geological Survey and the Scottish Environment Protection Agency and pulled together various datasets on natural hazard risk in the UK. Alongside these datasets we also consider how different hazards can have a wide range of effects on the different types of property we care for. Or in other words, would a flood at one of our standing stone sites have the same impact as a flood at one of our roofed castles? More often than not we find ourselves creating more questions than answers, but this is an important part of the ongoing process. That aside, we are making good progress towards improving our own understanding of natural hazard risk across the estate. The benefits of understanding the current risk from these hazards are far reaching. Crucially though, it forms the initial steps to better understanding one part of a wider range of future, climate change related, impacts at our properties. By understanding the risk now we are better prepared to assess the future risk. In many cases we are acutely aware of the threats already, but there is always more work we can do to improve and enhance our own understanding. The climate is changing, the risks are real and the challenge is accepted. Want to see what a climate ready Scotland may look like? Find out at Climate Ready Places. And you can read the UK’s own, newly released Climate Change Risk Assessment Report here.